1. The sight of Great Britain’s Mike Gregory, blond-hair blowing, legs-pumping, racing down the pitch - pretending Martin Offiah isn’t on his shoulder in support - and going over for a stunning try became the defining moment of his stellar playing career. 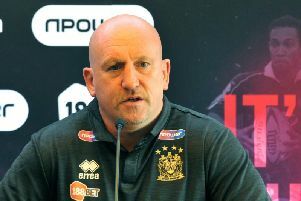 Wiganer Gregory, who later coached his hometown club, profited from the craft of namesake Andy (no relation) as the tourists won the third and final Test of the 1988 series against Australia by 26-12. The match is also fondly remembered for Wigan winger Henderson Gill celebrating a try with “a bit of a boogie”! 2. Australian fans old enough to remember him playing still wax lyrically about the impact Ellery Hanley made on Balmain. This was back in the era of England players guesting for clubs Down Under during the English summer break - the likes of Steve Hampson, Joe Lydon, Andy Gregory, Martin Offiah and Shaun Edwards also had stints away from Wigan. And Henderson Gill does a bit of a boogie! Hanley was a phenomenal success at the Tigers, taking them to the 1988 Grand Final - only to be knocked out by Canterbury’s Terry Lamb in a back-play incident that became part of Australian rugby league folklore. Balmain went on to lose the match. The pair reunited a few years ago at the SFS, with Lamb offering his apologies and Hanley gracefully accepting. 3. Wigan were invited to take part in the rain-soaked 1992 World Sevens - and won! They were surprised to progress to the knock-out stages, having finished their group with one win - but progressed by virtue of ‘most tries scored’. They swept past Penrith 22-8 in the quarter-final, a Denis Betts try in extra time swung a semi-final against Manly, and then Martin Offiah bagged four tries - to take his competition tally to 10 - in an 18-6 final victory against Brisbane. 4. In 2006, Brian Noble’s Great Britain produced an incredible effort to beat Australia 23-12 in the Tri-Nations. It was the match Stuart Fielden and Willie Mason clashed, Jamie Peacock and Willie Mason clashed, Sean Long and Willie Mason clashed... there is a recurring theme here, somewhere. And at the end, GB emerged victorious, with Wigan trio Sean O’Loughlin, Gareth Hock and Fielden - as well as ex-Warriors Brian Carney and Terry Newton - all excelling. Scary thought; Great Britain, or England, haven’t beaten Australia since. 5. Sure, Wigan lost, but the 2014 World Club Challenge deserved a mention. For a start, it is the only World Club Challenge to be staged at the SFS (it has hosted 11 Grand Finals, 14 Origins, 18 internationals and 669 premiership games). And it also marked the first time the English champions had gone Down Under to play in a one-off World Club match since the Cherry and Whites’ epic triumph at Brisbane in 1994. Thousands of Warriors fans - both expats and travelling supporters - were in the 31,000-plus crowd to see Sydney Roosters triumph 36-14.